Alison Saar is a Los Angeles native whose work explores themes of African cultural diaspora and spirituality. 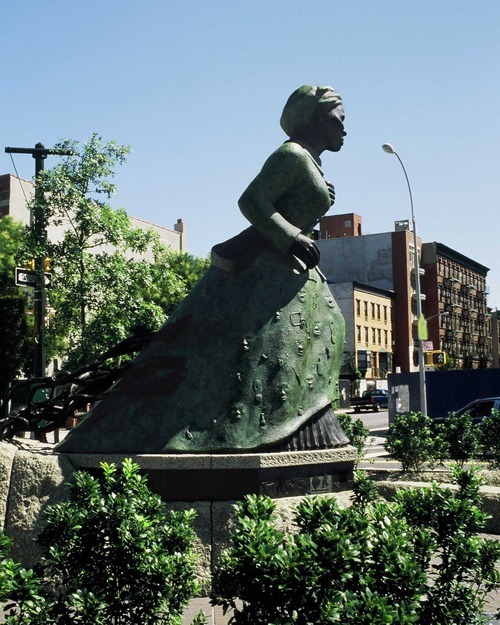 In November of 2008, Saar was commissioned for Swing Low, a powerful two-tone bronze statue of Harriet Tubman in a traffic island at West 122nd Street, St. Nicholas Avenue and Frederick Douglass Boulevard in Harlem. 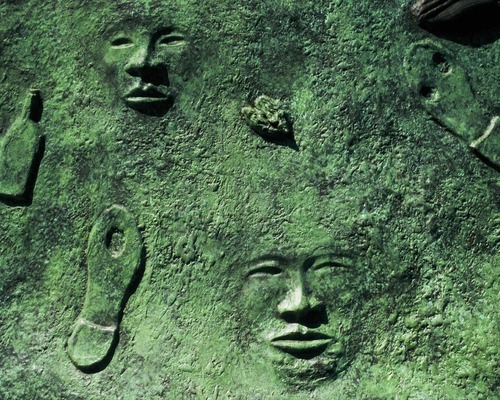 The memorial is a 13-foot-high bronze and Chinese granite portrait sculpture. Tubman strides forward despite roots pulling on the back of her skirt; these represent the roots of slavery. Her skirt is decorated with images representing the former slaves Tubman assisted to escape. The base of the statue illustrates moments from Tubman’s life, alternating with traditional quilting symbols. Percent for Art: How did you come up with the imagery of Harriet Tubman on locomotive tracks? Alison Saar: When I was first invited to come in and develop an idea for this piece, I started doing research on Harriet Tubman. I grew up in the ’60s when we were first learning about her and it was pretty superficial. I thought it was really important to see how she continued to put her own safety at risk, how she continued to put her own finances toward teaching other people in so many ways. I wanted to bring all those things to life in her story. What I wanted to do was depict outwardly her inward spirit of compassion, and her fearlessness. The piece started taking on this image of a locomotive – this unstoppable locomotive – because despite all these efforts and bounties on her, she managed to continue her work. Even beyond the Civil War she continued to do other things. That’s sort of where the train-like image of her petticoat came from, wanting to talk about that fierce, relentless spirit that she had. 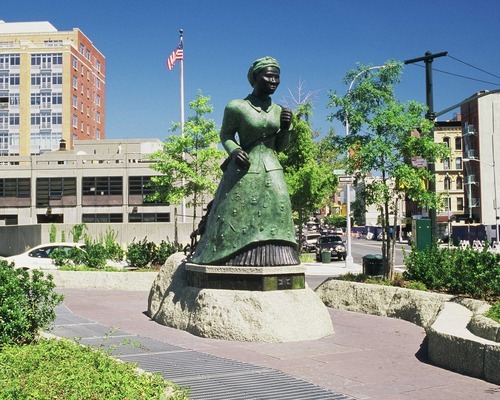 Percent for Art: How does the Harriet Tubman sculpture relate to your past work? Alison Saar: On occasion, I’ll do things that are more historically based. Generally, the work is very much from a personal sort of place. It definitely relates to work that I’ve done dealing with African American history. I’ve done other public pieces. There’s a public piece in Chicago about the Great Northern Migration. I’ve done a piece about York, who was Lewis and Clark’s slave during their expedition, for Lewis and Clark College. Most of the public commissions tend to be historical and looking politically outside my own experience. The balance of the work has been political, but coming from very much my own personal experience and personal point of view as a woman, as a mother, as an African American. Percent for Art: There was some debate about the orientation of the statue. Can you talk more about that? Alison Saar: I intentionally had her facing south. I really wanted to use her story as a call to others to reach out and participate in a similar way in terms of being compassionate and doing volunteer work. The community largely saw it as the figure not facing the direction of the Underground Railroad, which was north-bound. But for Harriet Tubman it was a two-way street, going back and forth, and that’s how I wanted to remember her. People kept demanding that she be turned around. What was nice about all of that was that it really opened up a dialogue with the surrounding community. Percent for Art: Is there a difference between how you think about your sculptures for a public audience vs. when a piece is destined for a private collection or institution? Alison Saar: When you’re working privately in the studio it can be purely your voice and your opinion, and the work can be dark and dealing with really sensitive issues, and the work can be angry. Public art is different. I don’t want to divide a community. Especially when you’re dealing with such a historical figure, you don’t want to put people off. You actually have to be really careful not to completely alienate half of the audience. Educate not alienate is my motto. Since 1982, New York City’s Percent for Art law has required that one percent of the budget for eligible City-funded construction projects be spent on public artwork. Managed by the NYC Department of Cultural Affairs, Percent for Art has commissioned hundreds of site-specific projects in a variety of media by artists whose sensibilities reflect the diversity of New York City. 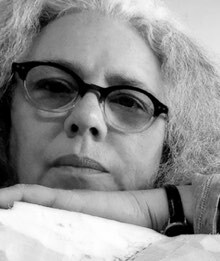 Alison Saar was born in Los Angeles, California, to well-known African American artist Betye Saar and Richard Saar, an art conservationist. Both parents encouraged their children to look at a wide range of art. As children, Saar and her siblings were given books on art and were taken to area museums. During high school, Alison began assisting her father in his restoration work. By dealing with artifacts from different cultures like Chinese frescoes, Egyptian mummies, and Pre-Columbian and African art, Alison learned about properties of various materials, techniques, and aesthetics. Saar received a BA from Scripps College (Claremont, CA) in 1978, having studied African and Caribbean art. Her thesis focused on African-American folk art. She received an MFA from Otis Art Institute (Los Angeles, CA) in 1981. Saar's work has been exhibited internationally with key exhibitions at the UCLA Fowler Museum of Cultural History, L.A. Louver Gallery, Phyllis Kind Gallery in New York City, and Pasadena Museum of California Art. She was an artist in residence at Dartmouth College. Among her many honors, Saar is a recipient of a fellowship from the John Simon Guggenheim Memorial Foundation, an Artist Fellowship from the National Endowment for the Arts, and a City of Los Angeles (C.O.L.A.) Artist Fellowship. View More: Next piece "Jane Dickson: Revelers", Home, Archive. Fabulous! I’ll be going to see it asap. 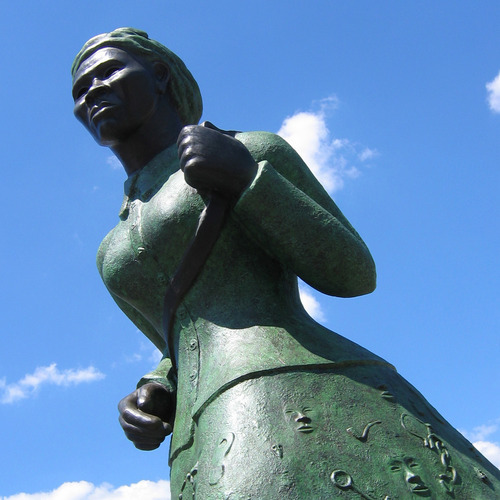 Saar did Ms. Tubman justice with every inch of her sculpture. She encompassed so much of Tubman’s journey. That she’s facing south is absolutely BRILLIANT! I’m off to research Alison Saar’s work. What a fine artist — exceptional! I’m struck by the face and hands, fully determined an fearless and the womanly bosom also part of her fearlessness. Stunning. Powerful. Beautiful. I cannot wait to see it onsite.